When I first started to actively pursue hiking, I had a pair of Merrell Moab Ventilators and a pair of Merrell Trail Gloves that I would rotate depending on terrain. I was a big fan of both shoes, but slowly moved away from the Merrell brand. I’m not sure if it was the lack of appealing designs, or the slow refresh rate on models, but it’s taken me four years to give another pair of Merrells a look. I had a chance to try a pair of the Merrell Capra approach/hiking shoes last fall, but didn’t put too many miles on them. Merrell’s newer trail shoes have really caught my eye at the moment. Here is an overview of the Merrell All Out Crush and Merrell All Out Peak. All Out Crush: The All Out Crush has a socklike fit with a breathable upper. I have a size 12 in these shoes and they fit very well. I usually wear a size 12.5 in trail shoes. The toebox has a nice shape with ample volume with no hotspots. Coming in at just under 10oz for my size 12, the All Out Crush is a very light shoe. The heel of the Crush is snug without any slippage. All Out Peak: The fit and feel of the All Out Peak is superior to the Crush in my opinion. Although the Peak is 2.5oz heavier, I like what that 2.5oz provides. The shoe feels much more substantial, and has more protection. The size 12 in the Peak fits just like the Crush. The heel is very snug on the Peak, much like the Crush. I like that the heel counter on the Peak is slightly more rigid. All Out Crush: Merrell uses a very open and airy mesh on the Crush with synthetic overlays. In a lot of ways, this shoe reminds me of the upper on the Altra Lone Peak 2.0. That’s good and bad. I loved the way that shoe breathed, but it didn’t provide much in the way of lateral support. I like to feel a little more of a wrap around the middle of my foot for security. The rest of the upper fits and feels great with no hotspots. This is a shoe that can be worn barefoot. One huge plus of having such an open and airy mesh upper is that they’ll dry very quickly. The Crush also incorporates drainage holes to ensure no water stays in the integrated footbeds. The tongue on the Crush is a comfortable piece of fabric and is gusseted from top to bottom. The laces lie flat without any uncomfortable bunching and do a good job of holding tight where and when I need them to. All Out Peak: The Peak has an equally comfortable, but more confidence inspiring upper. I say that because the Peak uses a light and airy mesh like the Crush, but also uses lateral wraps that go from the midsole to the lace eyelets. Merrell calls this the HyperWrap 360 Degree System. The upper is a little thicker than the Crush, but so far it has done a better job at keeping out fine dust, so that’s a nice tradeoff. For me, this shoe just feels great. Instead of running the laces through the shoe eyelets like on the Crush, the Peak has pull tabs that the laces run through. This gives the midfoot and arch a nice wrap and greatly improves lateral stability without being a hindrance. The upper of the Peak has a mesh guard that runs over the top of the tongue and under the laces. This reminds me a lot of the first Salomon Crossmax. I really like this design and it works well on the Peak. The toebox of the peak is built on a very comfortable last. The shape is made just like the human foot, but with precision. I love how my toes can splay and feel comfortable without feeling loose or sloppy. Merrell really hit a home run with this last design. All Out Crush: The Crush uses Merrell’s Uni-Fly midsole with a trail protect plate. This shoe has 24mm in the heel and 18mm in the forefoot for a 6mm drop. I wore the Crush around and although I wear a few shoes I really like at 18mm in the forefoot, the Crush felt a bit too minimal for me. For those that like a minimal shoe with great feel for the trail, this is the shoe for you. It might be that the midsole EVA density is a little too soft for me, as I like a much denser ride. All Out Peak: The Peak also uses Merrell’s Uni_Fly midsole with an air cushion in the heel like Nike’s Zoom Air units. The Peak also uses a nylon arch shank in the midsole for added torsional rigidity and stability. Although the midsoles are both made up of the same compound, I much prefer the ride of the Peak. The Peak measures 25mm in the heel and 19mm in the forefoot for a 6mm drop. All Out Crush: The Crush uses a full coverage M-Select grip outsole, which is Merrell’s inhouse outsole as opposed to a Vibram offering. The lugs come in a great pattern that put traction where you’ll need it most. The compound used on the outsole is very soft and moves a few millimeters with the push of a finger. Soft rubber tends to be grippy, but lacks in durability. Time will tell with these. One of the coolest features is the flex cutouts in the forefoot. This is a very flexible shoe. All Out Peak: The Peak has a robust Vibram Mega-grip outsole with rounded chevron shaped lugs in the middle, and oval shaped lugs around the perimeter of the shoe. The outsole has 12 cutouts that expose a little bit of the midsole crash pads. I like full coverage outsoles for protection and durability, but these cutouts do a good job of reducing overall weight. I really like Vibram Mega-grip for the trails I hike. They do a great job of gripping to rocks, boulders, sandy flats, and flat granite slabs. The Crush retails for $100 and the Peak retails for $130. After trying on both shoes and taking them through their initial paces, I returned the Crush and kept the Peak. For me, the extra $30 is well worth it when I consider the added benefits of the Peak. The Crush is a great minimal lightweight shoe with lots of flex for those who like such a shoe. I prefer a little more burliness and stability in footwear, and I really like the added protection in the Peak. I’m also a fan of the Mega-Grip outsole in favor of the M-Select outsole. You can’t really go wrong with either shoe. Try on both and see which one fits your needs and preferences. The All Out Peak look so badass that I just want to run out and buy a pair! The All Out Peak is definitely a great looking shoe! Hi Drew, do you think the Peak would be ideal for the Camino de Santiago? Looking for something lightweight but sturdy enough of course. Hello, Emma. The Peak could be a very nice choice. It has great traction and great cushion. People sometimes forget about the cushion piece when walking the Camino. Trail shoes are great for grip and traction, but the cushion is a godsend on hardpack trails and the miles of asphalt. We live by Merrell! Hehe! However, we noticed that their new product lines lack distinctive heel brakes. We find heel brakes extremely useful when standing on sloping terrain. Nice! 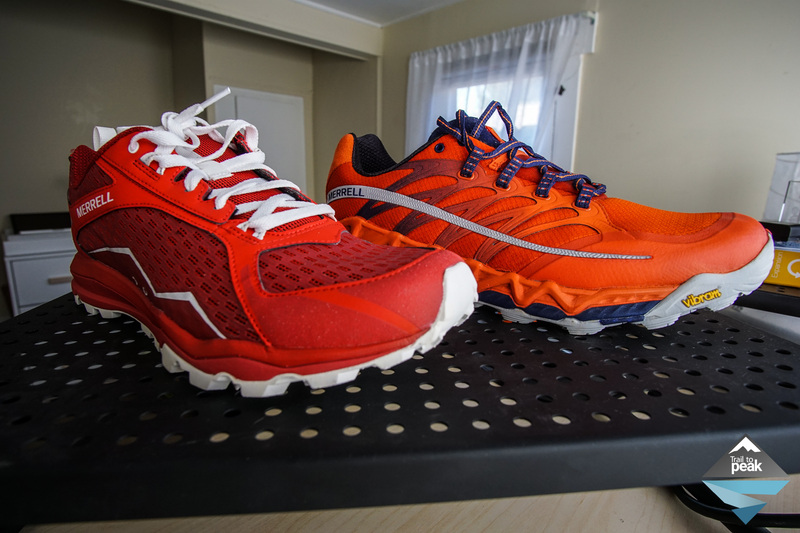 Their new product lines are definitely built on a more svelt trail runner last. I can see what you mean that they lack the same heel. I like the updates, but can see how some would not. Merrell all out peak are the bomb! Great blasting down hills with sublime cushioning. My No.1 best shoe for all trail conditions including the most steep rock climbing or soft clay/soil or the loose stuff. My previous best shoe was the Pearl Izume N2 trail. Merrell has far better grip and comfort with just 2 grams heavier. I’m completely sold on this shoe forever!!!! Take these up high in the snow and ice miles and miles of comfort and grip. Ultra trails for sure. Run fast on the gravel road too. I believe there’s airbags in the heals…less leg fatigue and great for downhill speed confidence. Snug heel and midfoot fit with plenty of toe box height to wriggle toes or wear heavier socks for the snow, Overall superb fit with no forward foot slip on steep descents. The grip of these lugs is amazing even on the smooth surface. I think also that these shoes will really help keeping feet dry in the very wet underfoot conditions. I also like the degree of rigidity over too flexy shoes which put greater pressure on the forefoot toe spring off. The balance is just perfect for me. Love em. I have been really impressed with the All Out Peak. I got my pair in 2015, wearing them to a Spartan Beast/Super (X2)/Sprint, Tough Mudder, Savage Race, a few different smaller 5k events. Just hose them off, then soak them in a jug of water mixed with detergent, and good as new. The quality is fantastic, the grip is amazing. My only beef with them are that they can feel heavy when they are wet, and no drainage holes. Other than those things, they are a great sneaker to use for trails or an obstacle course. Thanks for the info on your experience. I’m always interested to hear how shoes fare in the Spartans and Tough Mudders. Those obstacle course races can really test your footwear. Hey Drew, thanks for the great review. I was wondering if you had any update re the durability of the all out peak for hiking? I’ve seen several reviews that talk about the mesh spawning holes, but otherwise really like the shoe. Hey, Adam. I didn’t put enough miles on the All Out Peak to know for sure. I test so many shoes that I don’t always get to do a long term review on many. You can search “long term review” on this site to see which shoes I wear for more than 400 miles.